The Wichita Regional Chamber of Commerce PAC dedicates a large portion of its spending on placing its crony in office. There is an updated version of this containing data from new reports. Click here. In the contest for Sedgwick County Commission District 4, the Wichita Chamber of Commerce is spending heavily on one candidate. That’s 78.8 percent spent on one candidate. Besides the spending on Nicks, the Chamber PAC sent money to legislative and statewide candidates. Most contributions were for $500, with the most notable exception being Governor Jeff Colyer at $2,000. 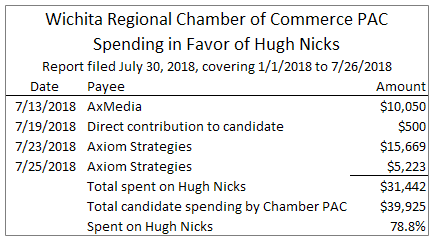 Really, the Chamber’s spending hasn’t been so much in favor of Hugh Nicks as it has been against his opponent Richard Ranzau. And this campaigning by the chamber has been largely based on outright lies and farcical leaps of logic regarding Ranzau’s record. Their record is documented on the pages of Voice for Liberty. We’d like to be able to trust the Wichita Chamber of Commerce. We want to trust our business and civic leaders. We want the Chamber and its surrogates and affiliates like Greater Wichita Partnership to succeed in building the Wichita economy. But the Chamber is shaming itself in this campaign, and spending a lot of money to do that. When James Chung (and others) says our manner of operation is not working, it’s the Wichita Chamber of Commerce and its ecosystem that must assume a large portion of blame. Having failed the people of Wichita, now we know just how much the Chamber wants to put Hugh Nicks on the Sedgwick County Commission. I believe Bob Weeks is spot on in his analysis of the Wichita Chamber of Commerce and its ecosystem. I think there is a general sense of outrage among Wichita voters (and citizens) to those special interest groups the Chamber represents that was clearly manifested in the two recent two sales tax referendums the voters defeated at the ballot box by 60% to 40% margins. I too believe that James Chung’s report demonstrates the negative impact this insider elitist control group has had on the esprit de corps of everyday Wichita citizens and small business owners. It is time for exposure of this group in order to accomplish the real reforms needed to move our exceptional Wichita area community forward again.